We're happy to unveil the official map of Balor! Obviously this is huge for the lore fanatics or anyone interested in SE roleplay, as well as our awesome Fanfic community. This is a fantastic piece by the talented cartographer Jared Blando! Providing a poster resolution version is pretty cool I must say. Gotta love how there are more ruins in the Wilds than there are cities in Lyth. Man that gender disparity really took a toll. 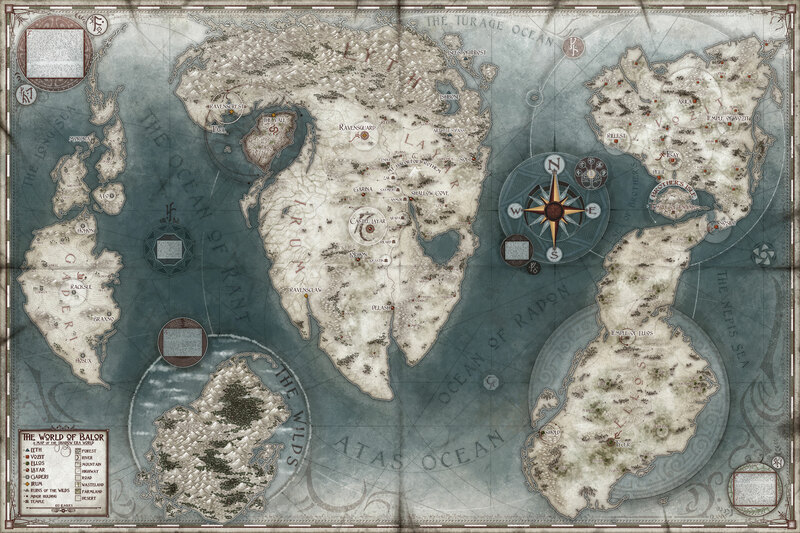 Who did the (awesome) art for the map of Balor? Another amazing piece of artwork to add to the Shadow Era collection. Pick up a huge poster of the map of Balor at GenCon! Printed at 24X36" on excellent paper, you'll really appreciate the level of detail and be ready for the upcoming Shadow Era campaign mode. Visit Jared Blando in the artist alley at Gen Con to get your poster and get it signed!